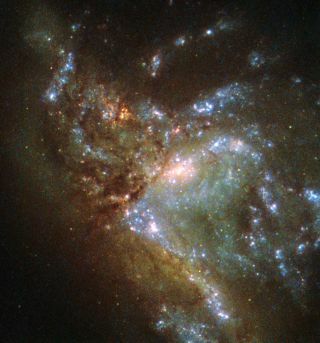 The Hubble Space Telescope captured this image of the galaxy NGC 6052, which is actually two spiral galaxies in the process of merging. You can ring in the new year with some celestial fireworks, courtesy of the iconic Hubble Space Telescope. Hubble has taken a colorful photo of the galaxy NGC 6052, which lies about 230 million light-years away in the constellation Hercules — and is actually not a single galaxy at all. "However, it is in fact a 'new' galaxy in the process of forming," ESA officials added. "Two separate galaxies have been gradually drawn together, attracted by gravity, and have collided. We now see them merging into a single structure." While NGC 6052's shape is chaotic now — or was 230 million years ago anyway, when the photons detected by Hubble began their long cosmic journey — the galaxy will eventually settle down into a stable structure, ESA officials said. The Hubble Space Telescope, whose science operations are managed by the Space Telescope Science Institute in Baltimore, launched to low Earth orbit in April 1990 aboard the space shuttle Discovery. Hubble's initial images were disappointingly blurry, and scientists soon realized that the telescope had left the ground with a slight flaw in its primary mirror. That problem was fixed by spacewalking astronauts, who installed corrective optics in December 1993. Astronauts repaired and upgraded Hubble four more times, on servicing missions in 1997, 1999, 2002 and 2009. The iconic telescope is still going strong, and its operators have expressed confidence that it should continue capturing gorgeous images of the cosmos through 2020, and possibly even farther into the future, provided nothing unforeseen happens.